In the wardrobe you’ll find more about my pursuits toward a simplified wardrobe and finding a style! A bit earlier this year, I started considering getting an Apple Watch and researching their benefits and drawbacks. The tech world can be so confusing sometimes as one expert says that it’s a total miss and another says that they use it every day and love it, am I right? In the end, I decided to go ahead with getting one in the hopes that it would make our everyday lives go a little more smoothly. I almost always have my phone right beside me in case I need to be reached during the day. While I realize that this is overkill for some people, we have some family members who have had health issues and I like to be available in case, Heaven forbid, there are any emergencies that come up. I don’t always love toting my phone everywhere I go though. Carrying it around the house seems a bit too much for me while I’m playing with my little girl or handling chores. Having the phone out while we are at playgroup is not my preference either. I loved the idea that I could easily see text messages and even receive phone calls on my wrist with the Apple Watch and ultimately that is what sold me. As with all Apple products, the packaging is top notch and sets you up for a wonderful feeling watch. It feels substantial in your hands and on your wrist. I ended up purchasing the aluminum watch in part because I have been eying some pretty yellow bands and I just can’t picture them working with the beautiful rose gold watch. I have some concerns that the white watch band will get dye stains on it from clothing or other items given it’s silicone feel. I’ll be interested to see how it holds up with use. The startup for the watch was a breeze and very intuitive, as most Apple products are. Right away, I loved checking out the different watch faces. My daughter will definitely love the Mickey and Minnie options! I love that I can have custom photo watch faces also. As I look around at the apps on my watch, I’m certain that Apple must work on the format of the apps page in the future. It’s not terrible, but it’s certainly not what I would call a “good” format. I do like the dock where you can pin frequently used apps for quick access. I’m always appreciative of any personalization options available. All in all, the Apple Watch feels great and is fun to play around with as I check out the features. I’m looking forward to giving it a try and seeing if it’s a good fit for my life as a stay at home mom. I’ll be checking back in with you in a couple of weeks to let you know how it goes! 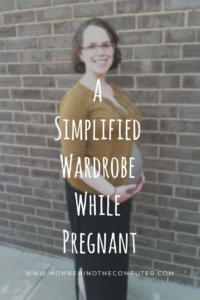 I’ve been working to simplify my wardrobe since before my little girl was born. After I became a mom, I realized that I had even less space, time, and energy for upkeep and styling of my clothing and began focusing even more on creating a capsule wardrobe for myself. For me, a capsule wardrobe is full of pieces that can mix and match to create different looks and/or pieces that I am just totally in love with. It’s still a work in progress and I’m always looking for ways to add new looks to my outfits (particularly if they are inexpensive and don’t take up a lot of space). 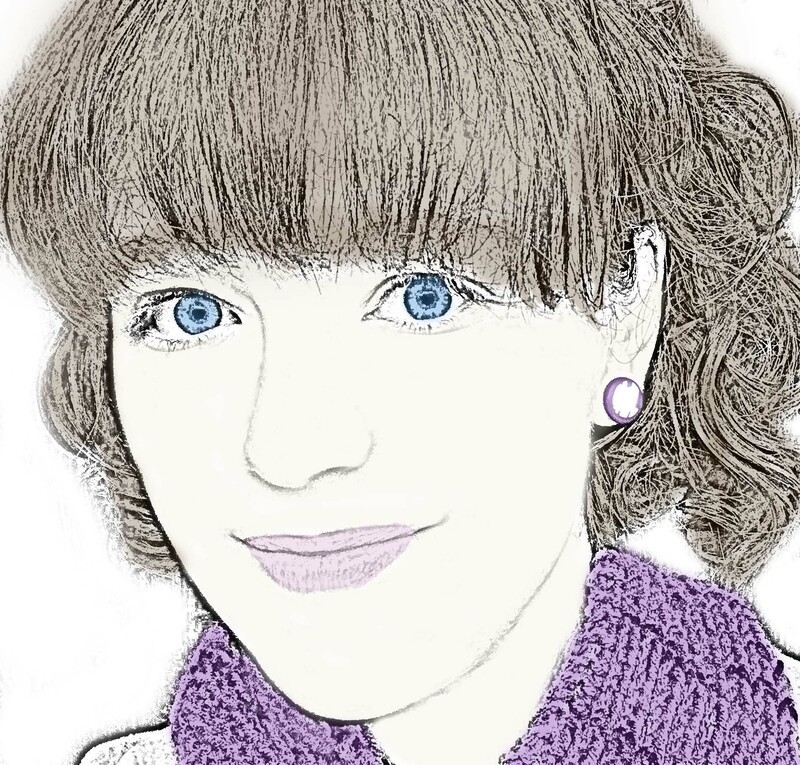 Enter Poppyclips! Poppyclips are beautifully crafted fabric accents with strong magnets that hold them onto place on your clothing. I was so impressed with the quality of my Poppyclips and the strength of the magnets. My Poppyclips weren’t going anywhere! These adorable little accessories add so many possibilities within a capsule wardrobe. You can add them to scarves, sleeves, pants, and even boots! Check out my video above to see how I changed one outfit into four extra looks with just one pair of Poppyclips! Ready to expand your own wardrobe with Poppyclips? You can purchase your own pair of Poppyclips on the Poppyclips website. Disclosure: Poppyclips sent me this set of Poppyclips in exchange for a review. All thoughts and opinions expressed in this video and post are my own. 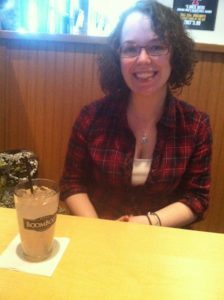 In November of last year I documented what I wore for the entire month (you can see my outfits here). I had cut back on my wardrobe just a bit and I really enjoyed the process of actually seeing what I was wearing each day. Surprisingly, the outfits seemed to look better on me in the photos than I felt that they did when looking in the mirror (good angles maybe? I’m going to go with I probably look better than I think I do most days). I liked making combinations from fewer clothes. I had mentioned to some friends that I was considering trying Project 333 for the Spring or Summer. No one but us knew we were expecting when this photo was taken, but I was already in need of new clothes to fit my changing body! Since I was already close to not fitting in my clothes, I immediately had to go out and buy a few stretchy items to get me through until we started telling people and I could request my thrifty momma watch out for deals at the clearance racks, thrift stores and yard sales (she’s since provided me with at least 75% of my pregnancy clothing from there!). I felt frustrated at the thought of trying to figure out how to thriftly clothe my changing body over the next year (let’s face it, things are still going to be a little complicated clothing-wise when the little one comes). My mom found me this great skirt on clearance. But the process has been more smooth than I expected and I’ve learned a lot about dressing simply and with less through the experience. Here are some tips that have worked well for me while trying to clothe my ever-changing baby-growing body. I haven’t bought much new since becoming pregnant. A few pieces that I have gotten a lot of use out of, but for the most part maternity clothes (like everything “special occasion”) seem to be overpriced. Plus, I feel like I don’t know what my body is going to be like in a few months and I don’t feel like paying $20 for a t-shirt that may or may not fit. My aforementioned momma has been great at helping me find clearance, thrifted, and yard-saled items at great prices. Most are in great shape and, if they don’t fit very well, I don’t feel guilty putting them away for after the baby arrives or passing them on. My Sister-in-Law helped me find a great on some maternity tops (including this one) on a Facebook yard sale group she is in. 2. Re-organize and store your “old” clothes. 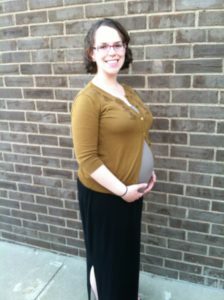 While you can probably still use many items for long into your pregnancy (I’m currently wearing two pre-pregnancy shirts right now), you won’t be able to comfortably fit into everything. Don’t let those pieces clutter your closet and choices. Get a nice plastic bin and pack those away for the time being. Once I got those clothes out of the way, I found it a lot easier to re-organize how I stored my clothes. I’ve loved this since it makes finding clothes to wear easier than before! I’ve recently began the habit of doing a load of laundry each day (or so). This keeps my favorite pieces always fresh and clean and ready to be worn. While I’m not against getting a few wears out of clothing, the summer and being pregnant means that isn’t happening right now. Staying on top of the laundry means I can wear my super comfy maxi skirt to work each week if that’s what I want. 4. Don’t be afraid to invest in great pieces. I’m certainly not for breaking the bank, especially when your body is changing all the time, but if you see a good investment piece don’t pass it up. The skirt pictured below was purchased at full price, but I’ve worn it at least once a week during my pregnancy so I’ve definitely gotten my money’s worth out of it. I’m expecting to be able to use it for at least a little bit after the Little One comes as well. 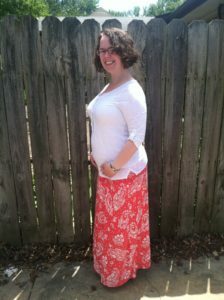 I love maxi skirts now that I’m pregnant. I may never go back! 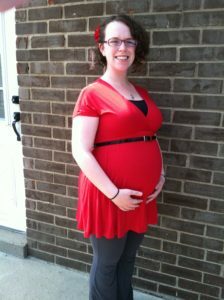 While I’m not officially doing Project 333 since being pregnant, I am dressing with less for sure. The whole process has surprisingly made me feel even better about trying Project 333 when my body finds its way back to normal. Courtney also offers a micro-course about dressing with less that I may try to kick off my new wardrobe when that time comes!